NuWave Precision Induction Cooktop Double Burner. Brand New in Original Packaging. Uses 70 percent less energy than conventional ovens. Minimum setting of 100 degrees. Maximum setting of 575 degrees. Cooking should be fun and relaxing, not stressful! Let the NuWave Precision Induction Cooktop Double (PIC Double) Burner transform the way you prepare healthy meals and help you discover a new passion for culinary arts. Regardless of your current skill level, the NuWave Double Precision Induction Cooktop Burner eliminates years of practice, giving you perfectly cooked meals every time. Great cooks know that temperature control is the key to great cooking and with the NuWave PIC Double, you can control the temperature from 100 degrees F to 575 degrees F in 5-degree increments. This 1800-watt cooktop burner eliminates accidental burns since there are no open flames or hot coils used. Ever forget to turn off the burner after you take the pan off? Thankfully, the NuWave PIC instantly turns off the heat the moment you remove the pan, making the NuWave Precision Induction Cooktop one of the safest cooking methods available today! What's more, the NuWave Double Precision Induction Cooktop Burner comes with a full booklet of recipes with precise temperatures and cooking times so you can make deliciously perfect meals right away, even if you have little or no cooking experience! The most dangerous room in your home is the kitchen and that's why the NuWave Precision Induction Cooktop Double was designed with your safety in mind. There are no open flames or hot coils to worry about which virtually eliminates the chance of stovetop fires. The induction reaction generates heat directly in the cookware itself. This means that no wasted heat surrounds the cookware, so the rest of the NuWave PIC Double dual cooking surface remains cool to the touch. Since the NuWave Double Precision Induction Cooktop Burner lets you set precise temperatures - at the push of a button - and time the food, you can walk away knowing it will get cooked perfectly. Use this convenient appliance as an extra stove top burner. Cook two dishes at once - it's perfect for sauces, boiling pasta, steaming vegetables and more! The PIC Double features two control panels with numeric keypads, one for each burner. In addition to 50 pre-programmed recipes, you can program and save up to 150 recipes using the PIC Double's memory function. This dual burner is designed for ultimate convenience and ease of use! 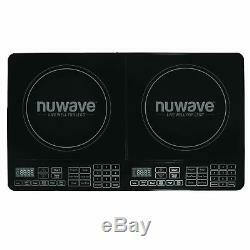 Perfect for smaller sized kitchen, the NuWave Double Precision Induction Cooktop Burner doesn't take up too much space. It's compact enough to rest on your counter or in your cupboards when not in use. Since the outside cooking surface of the NuWave Double Precision Induction Cooktop Burner remains cool to the touch, spills will not burn or stick to the ceramic glass surface. Your cleaning is all done with just the simple wipe with a damp paper towel. The NuWave Double Precision Induction Cooktop Burner lets you cook anywhere, all you need is an available outlet. This cooktop burner is perfect for dorm rooms, outdoor parties, entertaining guests with fondues or dips in your living room or dining room. You can even use it in garages to watch sports with your friends, or anywhere else you see fit! What's in the Box. Energy: Up to 70% less than conventional oven. Adjustable in 5-degree increments from 100-575 Fahrenheit. Keep Warm: Yes, 2-hour default setting. Auto-off: Yes, 1-hour default setting. Save up to 150 recipes (50 pre-programmed). Dimensions: 2.375 inches tall, 23.5 inches wide and 14 inches long. Product Weight: 13.8 pounds. The item "NuWave Precision Induction Cooktop Double Burner" is in sale since Wednesday, March 7, 2018. This item is in the category "Home & Garden\Major Appliances\Ranges & Cooking Appliances\Cooktops". The seller is "asavings" and is located in Brooklyn, New York. This item can be shipped to United States.